Product Information- Want deep long lasting nourishment? The rich formula of NIVEA Nourishing Body lotion provides deep nourishment and long lasting moisturization to help noticeably reduce dry skin. NIVEA Nourishing Body Milk supplies your skin with even more long-lasting moisture, leaving it smooth and making it less dry. Skin compatibility dermatologically proven. Available in 400ml, 250ml and 125ml. Directions for Use- Massage all over the body in circular motions daily for beautifully firm skin. This Nivea moisturiser for very dry skin comes in a beautiful deep-blue bottle with the trademark Nivea label and looks good! The cap is pretty much tight and it is travel friendly. It smells cream and milky- mildly floral and I like the fragrance. It won't bother those with sensitive noses. It has a good consistency and is available very easily! I have to say that it is one of the best moisturiser for very dry skin and this nivea rich nourishing body moisturiser spreads easily on the skin, takes like 2 minutes to get absorbed, when used liberally and then, you are good to go! This body moisturiser for dry skin keeps my skin soft, supple and hydrated throughout the day and my skin does not feel even a teeny-tiny bit stretchy. My daughter has extremely dry skin and she quite liked it too. 2) If you already have really sweaty and oily body skin then this might take longer to get absorbed and might make your body skin oilier. Me gusta Nivea también :)) Gracias por seguir mi blog! Look like it does a good job for body. sounds good nivea products are very moisturising! I always use NIVEA cream in the summer, after a sunny day! It's betel than any other after sun! I added you on GFC, I'm your new follower! If you would like to check my blog! Nice review. Will try this out! la marca nivea es mi favorita! I love using these in winters. My sister swears by this. 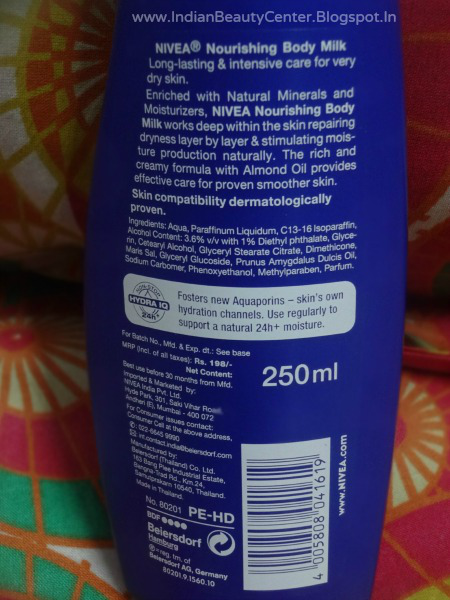 Seems like a great product ..
Nice review Arpita.. i love nivea products! !